Casual Quick Maths is a free-to-download app that is supported by advertisements. The game is easy to fit into short sessions and offers an increasing challenge to the speed of your mental arithmetic. Minimalism is a word used in Casual Quick Maths's AppStore description and it is very apt. From its visuals to its method of play and including the ways in which the player interacts with the challenge, there is never more than what is required to get the job done. But does this result in an effective maths app? There is a minimalist number of screens. In fact, the app goes straight into the game, there is no title screen or introduction. 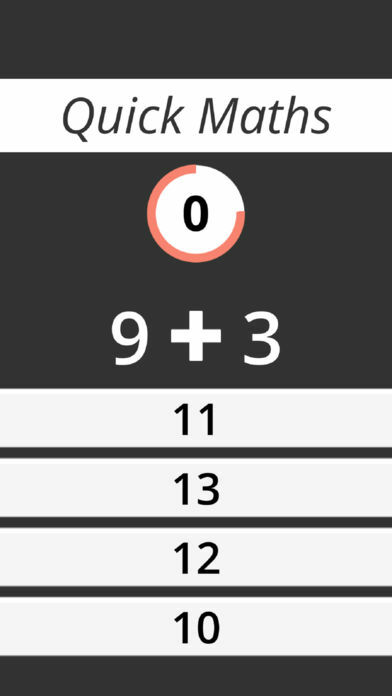 Fortunately, the layout tells the player all they need to know: answer the arithmetic question before the timer runs out. Visually, the app is very clear. The numbers that form the questions are white on a black background. They are large, crisp and easy to read. The different options for the answers are slightly smaller and presented on a white field that extends the width of the display. The only element on screen with colour is the timer wheel which, as it rapidly vanishes for each question, adds a nice sense of urgency. The maths is made up of a series of addition and subtraction questions each presented with a series of possible answers. 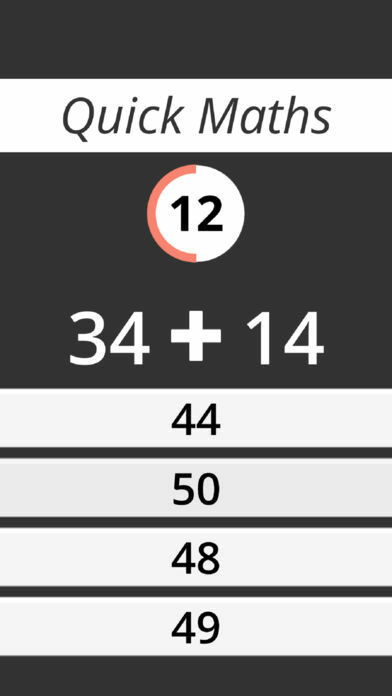 It is a practice app rather than a teaching app so players need to focus and develop their mental arithmetic techniques. 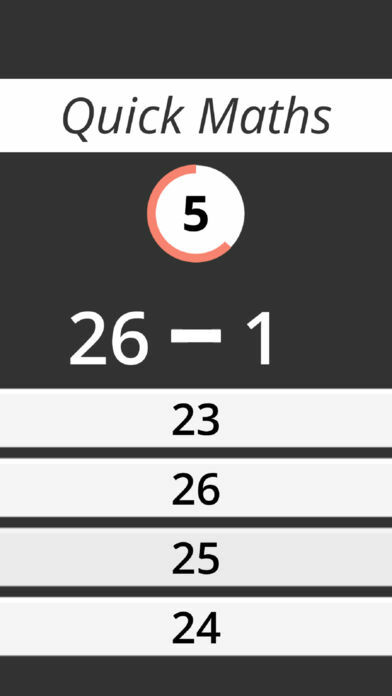 The possible numeric responses are tightly clustered around the value of the true answer so the correct button is not always obvious. They could do with varying a little more, though, as the most effective tactic is to add or subtract only the final digit and choose the answer that matches this result in its final digit. This is a good technique to learn and practise for error checking but as it seems to work for every question, a little more diversity in the possible answers to frustrate this method would be welcome. Casual Quick Maths is entirely free and there is no option for an in-app purchase. This does make it an advertisement supported app which, for teachers, could conflict with school policies so they should check these before downloading. For parents and children, advertisements are a familiar and often welcome way of building an app collection within a budget. The advertisements in this app are not intrusive in their frequency as they appear only at the end of a game. In the absence of a game-over screen, they actually work to bookend each attempt. On the downside, the garish and colourful nature of ads do tend to break the minimalist aesthetic of the app, though, so this is a compromise in that respect. Bettering your own score or those of other players, if you choose to use the facility for posting and comparing online, is the sole player goal in the app - aside from mathematical self-improvement, of course. Casual Quick Maths does all it sets out to do very well. It isn't a deep or flashy app by any measurement but as a quick-to-access and a challenging way to speed up your own or your child's mental arithmetic, it is a very worthwhile free download. Add and Subtract your way to mastery! Play at school, work, home, basically anywhere. - Minimalist visuals, easy on the eyes. - Compete for the best score in the world.